The older I get, the easier it is to stick with doing what is comfortable. Go to work. Come home. Eat dinner. Settle in on the couch with a cat on my feet. Binge Netflix. Go to bed. Repeat. Don’t get me wrong, some days, I need self love in the form of comfort and routine and the ability to slink into my couch until it’s time to slip into bed. But doing what’s comfortable across many days turned into doing what’s comfortable over many weeks, which turned into months and then into years… you can see where I’m going with this. Comfort kept me stagnant. Earlier this year I was forced to reflect on my preference for comfort and my risk adverse tendencies. I realized, with some help, staying in the comfort zone and avoiding vulnerability and risk kept me from doing things aligned with my values and that prevented me from living a fulfilling life. Moral of the story: when doing what’s comfortable and avoiding vulnerability, sure, there’s no risk, but there’s no reward, either. One of the values that makes me feel alive and fulfilled is creativity. Creativity also happened to be the value receiving the least amount of my attention. I made a pledge to make time for creativity and to take more creative risks for the remainder of the year. 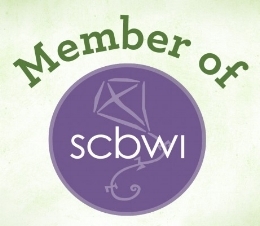 In December of 2017, I joined SCBWI on a whim, but I limited my involvement to message board lurking and quiet participation at the local shop talks. This spring, with encouragement from one of the regional advisers, I mustered the courage to attend my first conference (on humor, of all things). My anxiety was at red alert; I had no friends to cluster with and I didn’t (and still don’t) consider myself particularly funny. But I had a pledge to uphold so I clicked submit on the registration button and showed up at the conference, despite the protests coming from my mind and body. Making small talk with strangers? So. Uncomfortable. Being in the same space as published authors? Hello imposter syndrome. But I did it. I didn’t walk away with a new best friend, but I did find a couple women who welcomed me into their group for the day (and for that I am very grateful). Aside from a rich day of learning, attendees of the conference received the opportunity to query the keynotes (who also happened to be laugh inducing editors). For a newbie with wide eyes and dreams of being published, I couldn’t pass on an opportunity to get my work in front of an editor. Problem was, I had one manuscript to my name and no one had read it except for me, my husband, my mom, my dad and my sister. Another opportunity to choose vulnerability and risk over comfort materialized: I could choose comfort and avoid the fear of having my feelings hurt by not showing my work to anyone else for critique, or I could choose to be vulnerable and get feedback from someone who could help me make my manuscript better so that I could query the editor. I chose vulnerability and I was terrified. But I knew I had to put my best foot forward and in order to do that, I needed to get someone in the industry to provide feedback on my manuscript. I waited for the response from the critique with sweaty fingers and heart palpitations. When it finally arrived I clicked the email with one eye shut. What did I find? Vile insults spat at me through my computer screen? Confirmation that my work is crap and I have no talent and should just give up now? No. What I received was helpful critique that enabled me to make my manuscript better so that I could feel confident putting my query and creative soul into the world. Had I not made the decision to be vulnerable and allow myself to be the newbie who didn’t know anyone at the conference, I would not have had the opportunity to query my first editor. And once I ripped off the first-ever-query bandaid … well, I’m not going to say I was injected with confidence serum and now I can do anything. But I did get reassurance that I am capable of being vulnerable and taking risks. I can put myself out there and I can be uncomfortable (and know that sometimes being uncomfortable is 100% okay). This year, I’ve sent my work out to be rejected (or accepted) five times. It may not sound like much, but for me, those five queries represent personal growth and investment in myself and my love for writing. They represent my choice to be vulnerable so that I can find purpose, fulfillment in (and meaning to) my life.